Hi everyone! 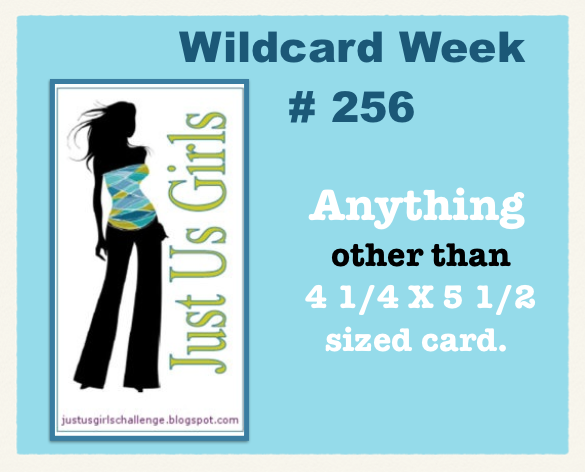 I am sharing my last card as Guest Designer for Just Us Girls Challenge. :( I have had so much fun this month. Thank you so much for having me. This week is Wildcard Week. We challenge you to make anything other than a 4 1/4 by 5 1/2 card. I used my very neglected Daydream Medallions stamp and matching framelits to create a cute Christmas card. I love the colors black and gold together. So striking for Christmas. Head on over to the Just Us Girls blog to see what the design team has created and join in! This is beautiful! I love the shape and the layered images and the rich non traditional colors on this Christmas card. You have been a super Guest Designer this past month and I hope we continue to see your lovely creations here at JUGS. Oh wow! So striking is right Kristie! Amazing! Love all the detail in those stamps...wow! I love the wonderful shape of your card. The gold, black & white are an elegant mix. Thanks so much for playing along with us this month and sharing your amazing talent. Your creations are always gorgeous! Hope to see you over at Just Us Girls in the future! This is amazing! Love the layers and the black and gold! Glad you saved the best for last! Thanks so much for being a great guest this month! We hope to see you around JUGs! Stunning shaped card! Love the color combo too. Thanks so much for Guesting with JUGS this month! You rocked out the challenges!! OH my goodness!! This is stunning Kristie! I have this same much neglected set too, and now I want to not neglect it! haha! It was wonderful having you this month Kristie!! You are very talented and did a wonderful job with our challenges! You ended your time with us with a beauty! Love this card!!! Take care and we hope to see you again! Love this card! I am thinking of CASEing this for a Thank you card for my nephew and niece for their wedding. She may be going with SunFlowers and the shape of this also reminds me of a sunflower. Kristie this is absolutely gorgeous!! Gorgeous shaped card Kristie. Enjoyed all your guest designer posts for JUGS during August. This is such a gorgeous card, Kristie! I love that you chose black and gold for your medallion...so elegant and perfectly executed! This is so freaking awesome!! I love the black!! What a wonderful medallion! Guest for Top Dog Dies & a Giveaway! StampNation & Winnie & Walter!